Have a small garden and need a small shed? Not a problem, with lots of compact designs on the market. What should you look for in a small garden shed? Well, small doesn't have to mean basic – as a bare minimum, it should have a couple of shelves. Better, fancier designs will have additional storage compartments in the roof or on the side, too. From simple, classic designs to smarter, painted options, we have gathered the best small garden sheds in our buyer's guide. 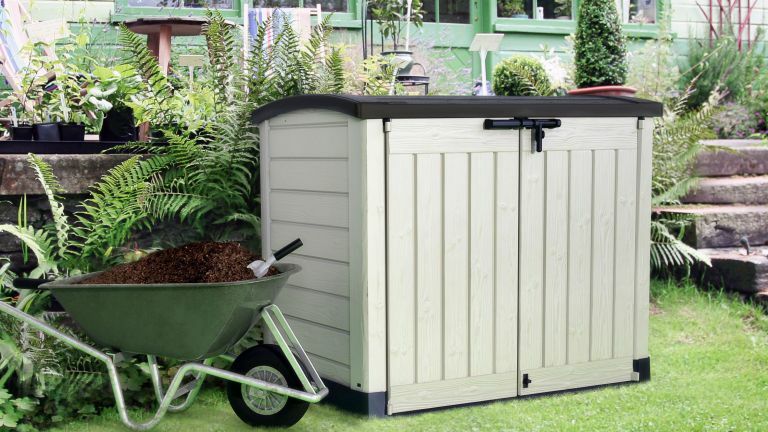 And if you need more space-saving solutions for your garden after choosing a shed, check out our 13 space saving garden storage ideas; find the best standard sized garden sheds in our buyer's guide, too. The Perugia Wooden Tool Shed by dCor design boasts a smart, curved design and waterproofing, including a waterproof roof. Built-in shelving will help you stay organised. Available at Wayfair. This slim Apex garden shed has a clever storage compartment under the roof, and built-in shelving in the bottom half; 63cm wide and weatherproof, it's a perfect slim number for very small outdoor space or patios. If the only garden you have is a small front garden, then you may need to think a bit differently about your garden shed. Avoid tall sentry designs, opting for a sloping, lower design instead. The Rowlinson Mini Garden Storage is only 150cm tall and 93.5cm wide, so it can easily sit by your front porch. Browse our front garden design ideas. If you want your shed to be as inconspicuous as possible (important if your outdoor space is really tiny), consider getting a rustic, untreated light wood number. The Aldsworth Tall Outdoor Storage Box from Garden Trading is just the thing – crafted from FSC-certified spruce, it will blend in with the neutral colours of garden walls and paths, so you will forget it's even there at all. It doesn't have additional compartments, but it's so good-looking that we forgive it. The Arc Plastic Garden Storage Box from B&Q is sturdy and secure, with a locking mechanism. You can store your wheelie bins in it (the doors cater to that), but it's also great for tools and plant pots. If you don't really have any tools that need dedicated storage, but love muddy welly walks, what you need is not a conventional shed at all, but a specialised welly boot storage shed. The Welly Boot Storage from Sue Ryder is very practical, and nice-looking with its painted finish.